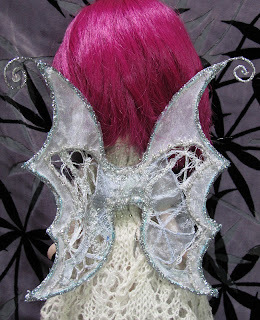 I promised a workshop on the Fairy Wings I made for a recent swap of Blythe Doll Clothes (this post) - so here it is. They're a bit warped and faded now but considering that they are nearly 9yrs old and those polyester fabrics are inherently fragile - I think they're doing quite well! So I chose to use very similar techniques to make much smaller wings for a Blythe doll. 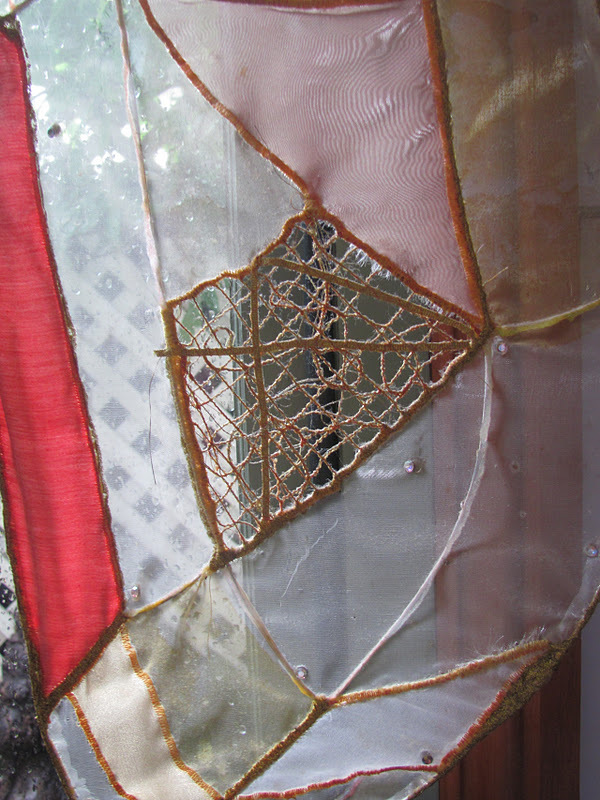 Wire, with twinkle fabric and machine-made free-form 'lace'. 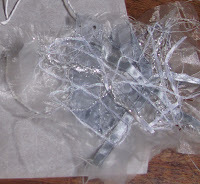 Hardware items : thin flexible wire (I used florists' wire but anything easy to bend will do), wire cutters, pliers to bend the wire, plumbers' tape (aka teflon tape - there are white, pink & yellow tapes and they do differ, I find that the white is the easiest to use. Florists use very similar stuff and theirs is either white or green and it costs a lot more). 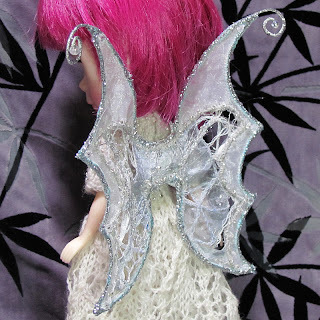 Now I dare you to go into a Hardware Shop and tell the butch blokes there that you need wire & plumbers' tape to make fairy wings for your doll! Hint : keep to a limited colour scheme for your wings as they could easily become really crazy. minimise the number of wire pieces to minimise joins. I had 3 pieces of wire - 1 went across the top from one curly bit to the other, 1 formed the rest of the wing outline and a third (not shown in this pic) made the 'hooks' that go over dolly's shoulders. where one wire joins another avoid T joins by bending one wire into a L at the end - that little bit will lie against the other wire and when bound with the tape it'll be stable. You can see the thicker bits here where there 2 wires meet. An explanation - you can join wire by soldering but I dislike soldering. Nasty hot things, acid in the flux, lead in the solder ... yuk! 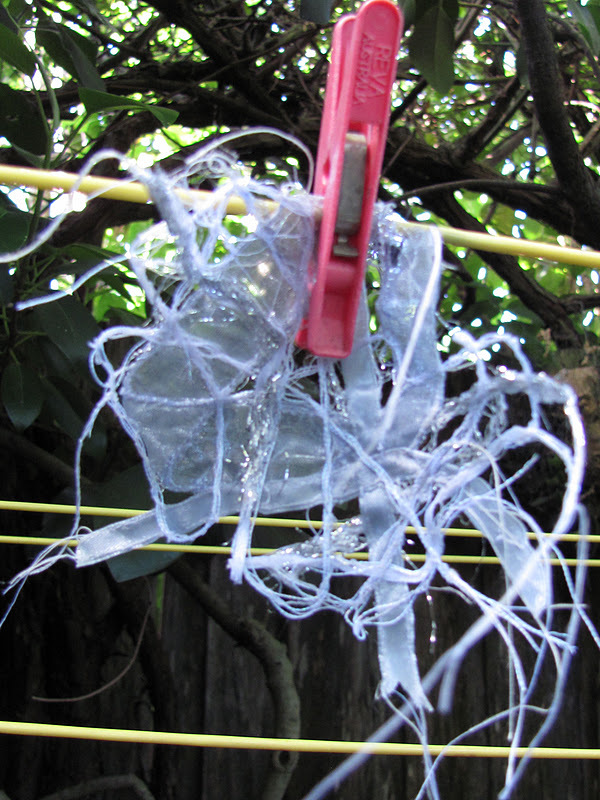 Plumbers' / Teflon tape is my preferred method of joining wire - I've used it for costumes and head-dresses, seems strong enough. SO - bend the wire to shape and cover with the plumbers' / teflon tape - it is stretchy stuff and it clings to itself. Pay particular attention to joins, and make sure any ends & sharp corners are covered nicely. 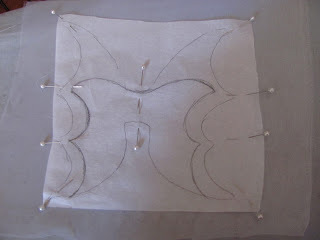 Plot fabric / 'lace' areas on tissue paper. 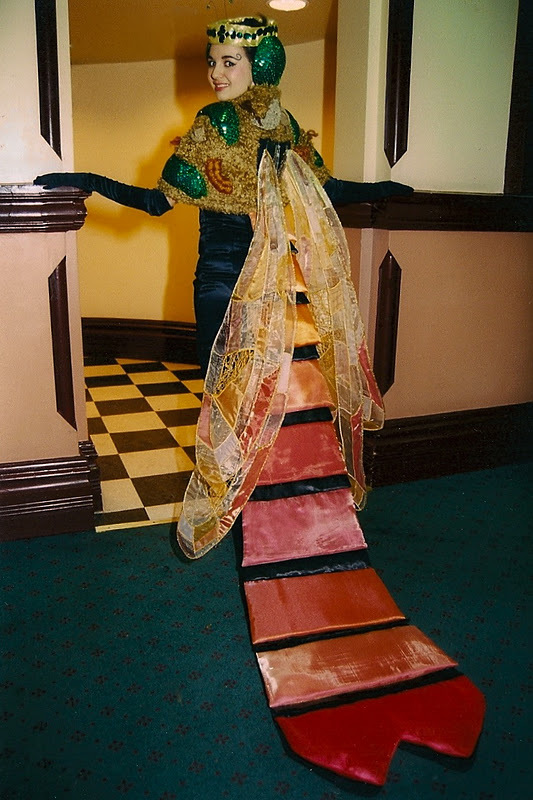 In this photo you can see those over-shoulder 'hooks'. 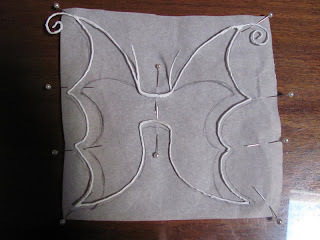 Pin wire wings to tissue paper and plan the area that'll be free-form 'lace'. 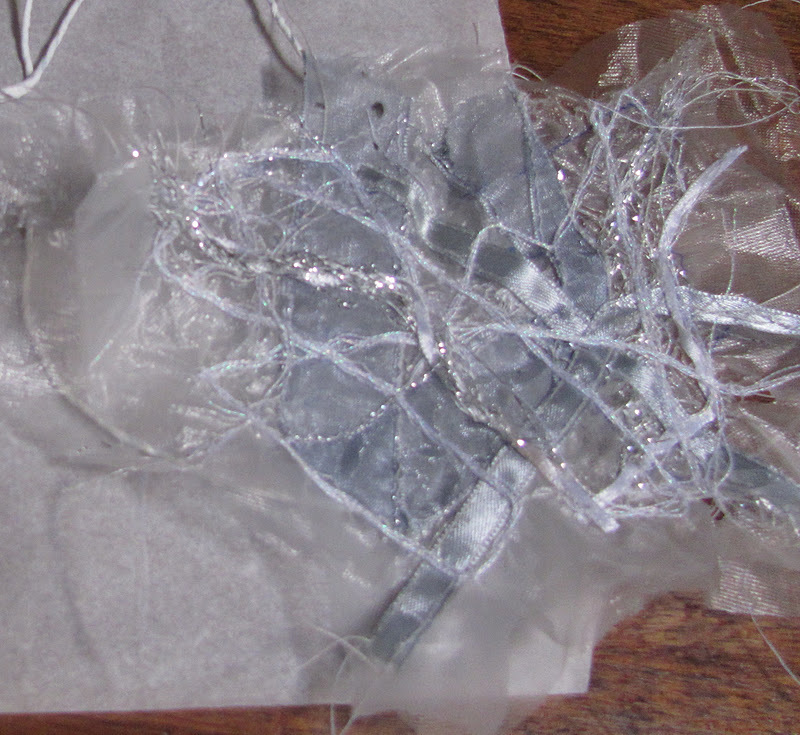 I found I could trace this onto my dissolve-away stabiliser ... but remember that it will shrink in the sewing - a lot! 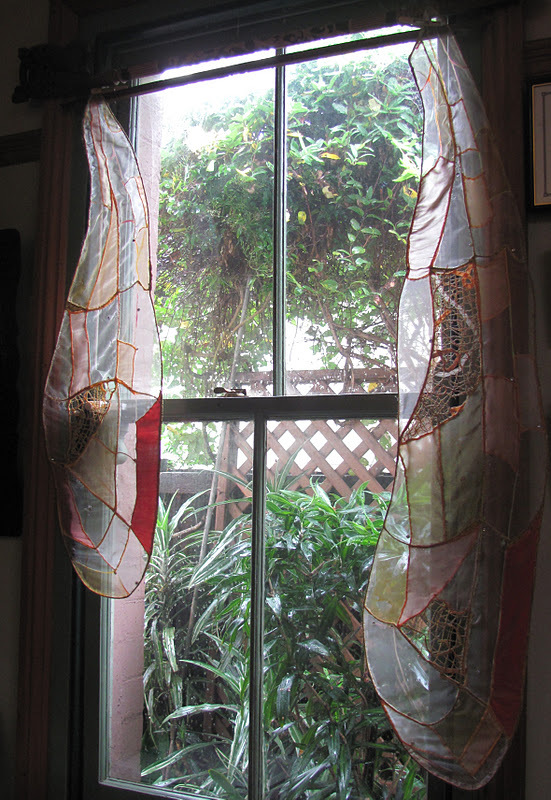 If you can, using a hoop while sewing the free-form lace will help stop the shrinkage. I used the stabiliser double - but it is old stuff and prone to tearing! Ack! what is that mess? This messy business is what I ended up with - check that it is large enough - mine did shrink with the sewing! "I'm melting! melting! Oh, what a world! What a world!" Now - dissolve the stabilser. 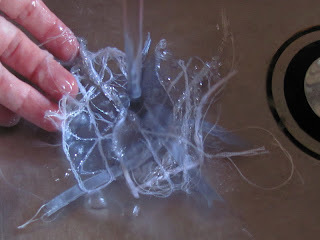 Mine is old stuff and I think it is gelatine based - it goes very slimy in the water - yuk!!! And even though I rinsed really well, some residue remained to make the 'lace' a bit stiff - which is OK really. 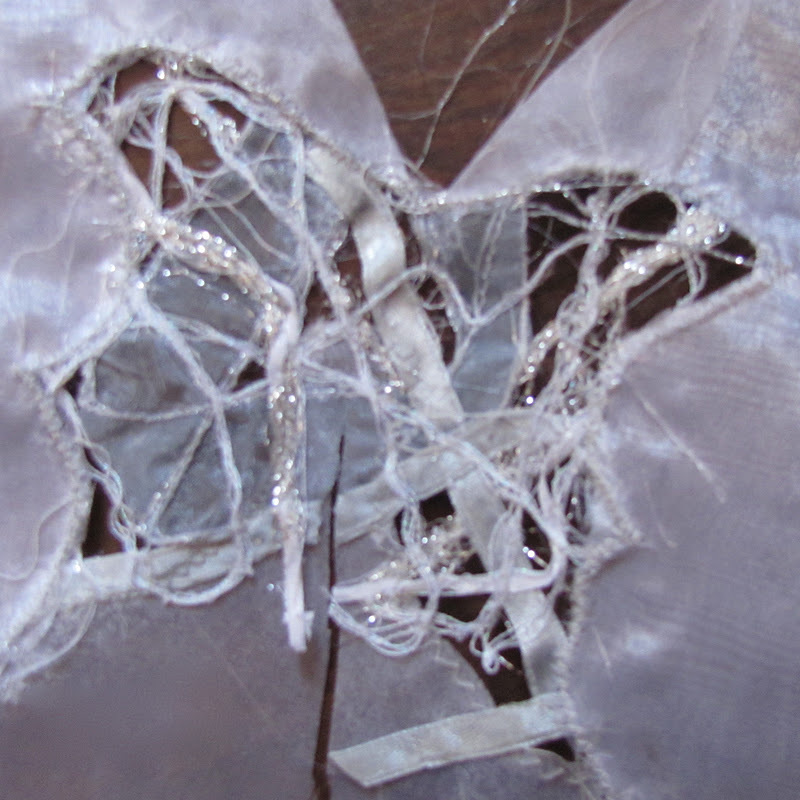 Flip that over and pin the now dry 'lace' in place, hold everything up to the light so you can see where - back to the sewing machine and sew a guide line round the edge where lace & fabric meet (shown a little darker above). 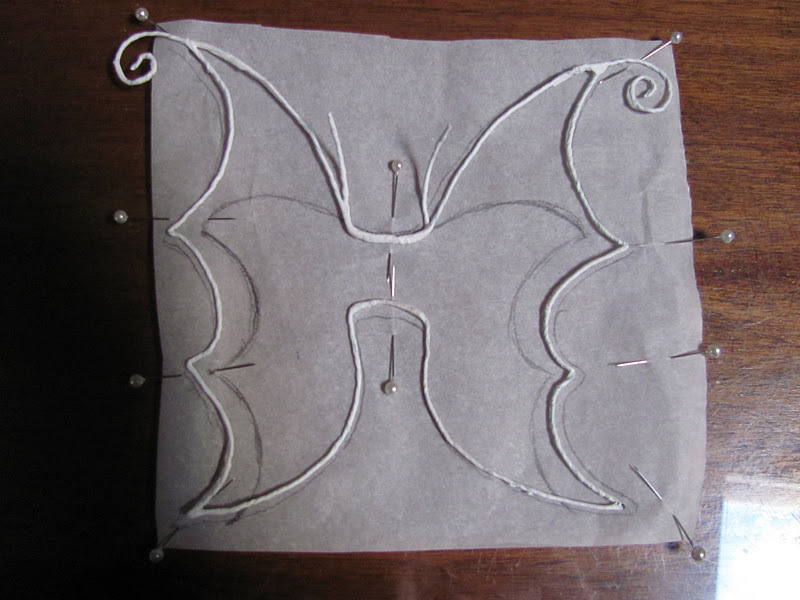 You can sew through the tissue paper, then tear it away and work a tight zig-zag (satin-stitch, like for a button-hole) over the guide line. Cut the fabric from behind the 'lace'. Be careful! 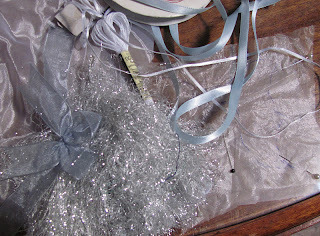 Fabric & 'lace' - fabric snipped because I kept forgetting to take progress pictures! 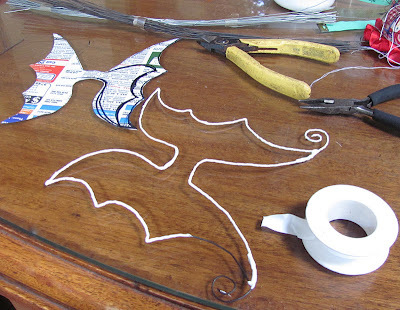 The next step is not much fun but your work will now start to really look like wings. 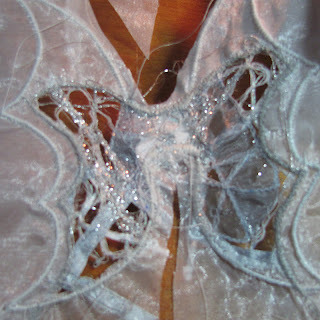 Pin fabric & lace piece to the wire and machine it. At this stage you can also add the felt or ribbon for the centre back reinforcement. See photo. If the needle hits the wire and it probably will - it will probably break. 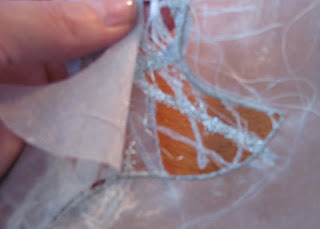 Cut the fabric and any 'lace' ends around the wire (on the outside!) 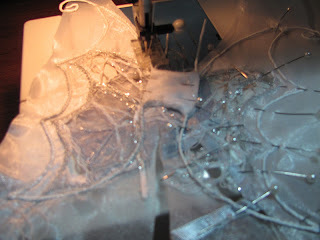 Then I go back to the machine and zig-zag a tight 'satin stitch' around again - no pins this time. Concentrate on getting the corners to look nice. Now for some more fun! I hand-stitched glass seed beads & glued some bigger beads to the ends of the curly bits. 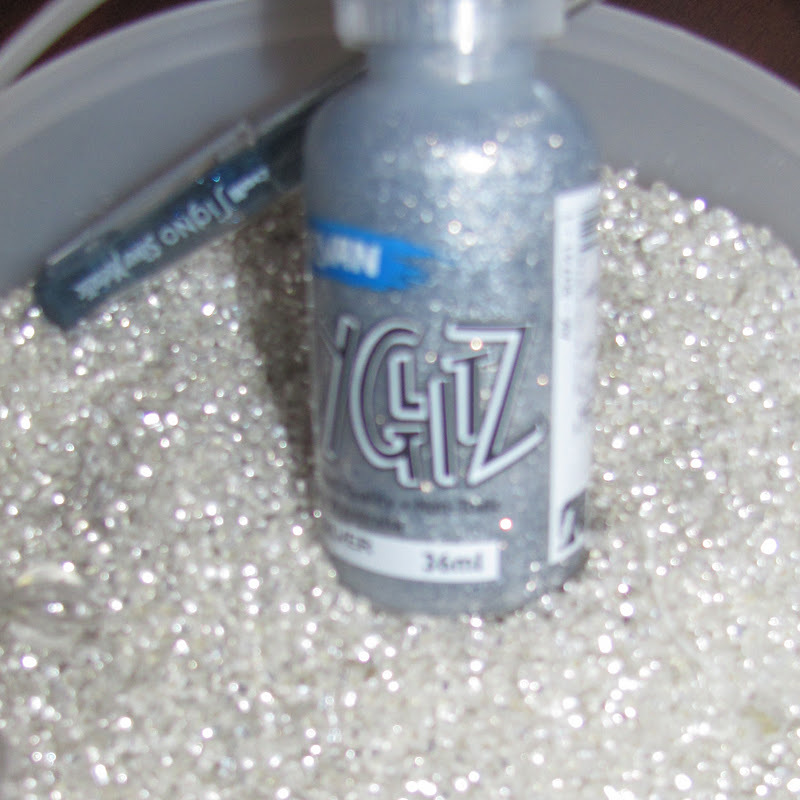 Then Glitter Glue all around the wire. It is only paper glue but it seems to add strength, it certainly keeps the thread ends tidy and it is pretty. I couldn't find any blue glitter glue - but I had a glitter pen in the right colour - so I drew blue on the edges and then put glitter glue on top. 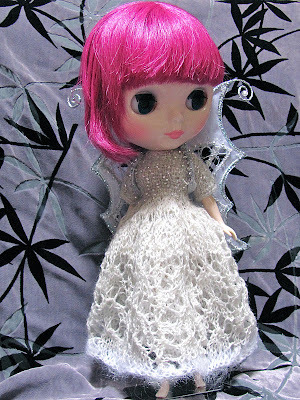 Improvements : Next time (and my Blythe dolls say they NEED some wings of their own - so there will be 'next times'!) I would make the centre back section less wide - it doesn't need to be so 'reinforced'. Just a little bit of ribbon perhaps on the inside to stop the wings getting caught on velcro or other fastening on the doll's clothes. Also, I did sew elastic to the shoulder 'hooks' in loops to that centre back bit - I think this was unnecessary and it was certainly fiddly. Next time I'll just make the shoulder 'hooks' a bit longer.